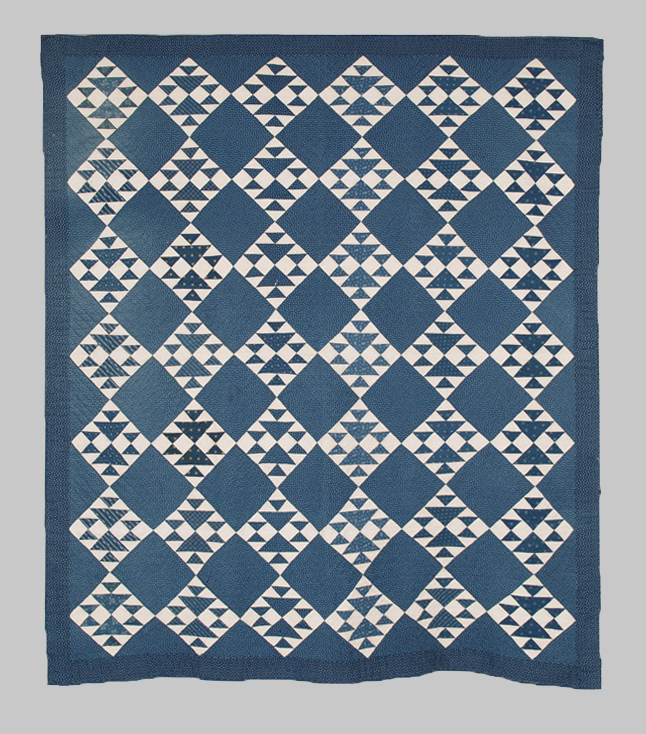 Blue and White antique quilts are the most popular color combination in America. One advantage of a two color combination is its ability to fit into any décor. No extra decorating adjustments need to be made for a blue and white antique quilt; it will be perfect in any room! We have Blue and White antique quilts in every size from crib to queen, and colors from the indigo shades of the 1800?s to the cheerful blues of the 20th century. 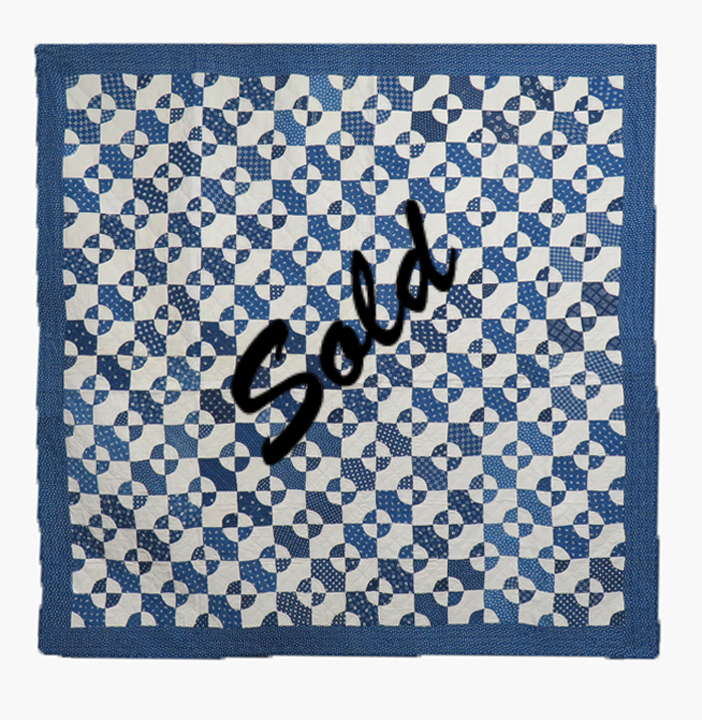 Click on the pictures below to see more views of my Blue & White Antique Quilts. Shading is due to lighting, not representative of the quilt. Please call for the availability or any questions. Please view the detail photos (click image above) for more accurate colors. The Martha Washington pattern was developed from the Ocean Wave pattern with the center joining square divided into four triangles. The edging is most unusual and is created using a border print which is indicative of the first half of the 19th century. However the style of border prints did return during the 1870's. Did someone take the border strip from an earlier fabric and apply it on this one as I believe may have happened. This border fabric actually pre-dates the other Indigo dyed calico fabric used in the construction of this very graphic quilt. 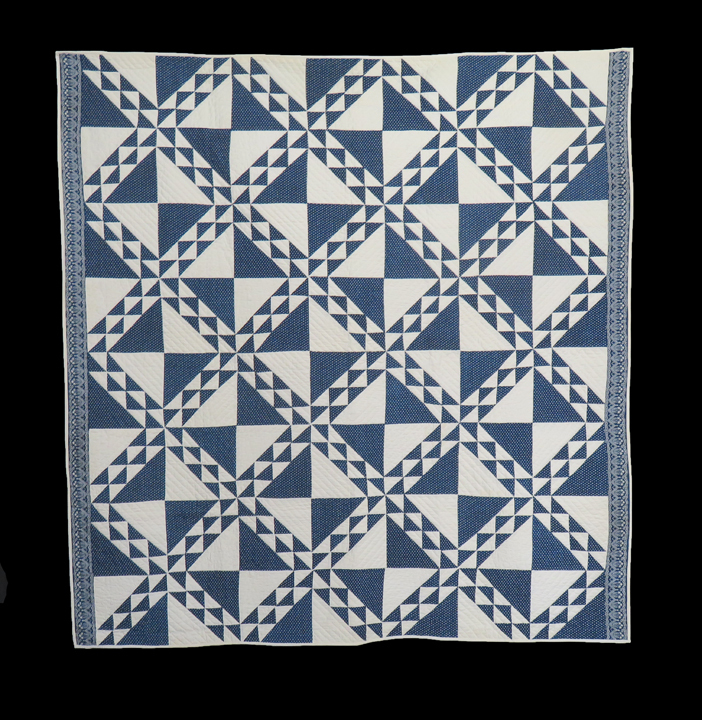 The design construction is comprised of 13” blocks on point with the four sides of this quilt filled in with triangles each measuring 7 x 7 x 10”, one white and one Indigo Calico between each square. Two sides of the quilt have a 3” border fabric edged with a 3/8” hand applied binding. In the quilt world, indigo and white is and has been the most loved color combination in America. Organically hand washed and ready to be sent on your approval. Meticulously hand quilted, this pieced quilt is one of my favorites. The small triangles measure apx 1-1/2 x 1-1/2 x 2", the large triangles measure 5 x 5 x 7”. If this quilt did not have a split center...two triangles..one white and one blue..the name of the pattern would be ocean waves, but with the split squares the name changes to Martha Washington. The applied binding appears to be put on by machine and finished by hand. This 19th century blue is a wonderful mid century shade of indigo; sought after by many people. Actually blue is the most popular color in our country. 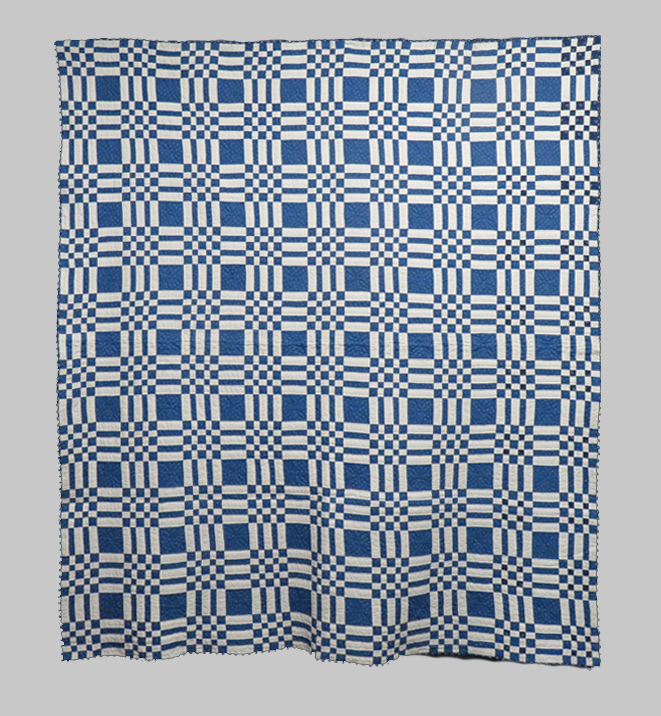 This graphic quilt will fit perfectly on a twin, double or the top of a queen size bed. A beautifully graphic quilt it can also hang as an art piece for your wall. Made in Lebanon, Maine, the family name will be given upon sale. Please view the detail photos (click images above) for closeup views. A wonderful example of a classic design and classic American color. Indigo seems to fit everywhere and is the most popular color in the country. Entirely pieced and quilted by hand, this beautiful and sophisticated Irish Chain Quilt is comprised of hundreds of 1-1/2” squares. The back and front are both constructed using fine cotton fabrics. With most two color quilts one can assume that the fabric was purchased and therefore the family was of comfortable means. The entire quilt has been quilted in a 1“ grid and was finished with a 3/8” binding. Organically hand washed and ready for your home. Family name available upon sale. This exquisite and very early quilt is comprised of 9 gorgeous feathered touching stars with center sunbursts. An extraordinary quilt, it is an actual piece of art. Ranking above the top of the antique quilt world, not only for its beauty, but also for the amount of work that it took to create. Completely sewn by hand, this mid-nineteenth century quilt was pieced with some of the smallest stitches I’ve ever seen. A trapunto and/or stuffed quilt is a multi step process. First the quilt top must be pieced, second it must be stuffed, then backed and quilted. The third step is the very laborious process of separating fibers in the back and stuffing them with cotton. The back fabric is a more loosely woven linen, making the threads easier to separate. On this quilt, there are 16” squares between the feathered stars joining the 18" squares on point. All diamonds have 2-1/2” sides, triangles 1-3/4 x 1-3/4 x 2-1/2" and the squares have 1-1/2" sides. The cross hatch diagonal quilting is apx 3/4” apart. Organically hand washed and ready for your viewing. Call Betsey for more details. 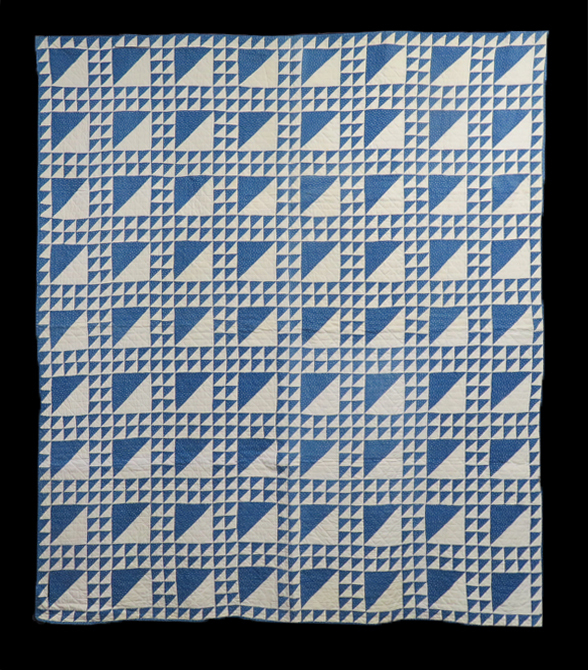 This sweet blue and white Geese in Flight quilt is comprised of hundreds of triangles. There are even triangular prairie points on 3 sides of this quilt while the top side has been left straight. That side would be more comfortable under one’s chin. All triangles measure 5-1/2 x 3-3/4 x 3-3/4”. This quilt will fit a twin or double bed, or can be used as a throw or graphic piece of art for the wall. Each triangle is hand outline quilted. The binding is applied by machine and finished by hand. The quilt appears to be unused and has been organically washed and is now ready for your approval. Absolutely stunning is my first reaction to seeing this quilt hung. The graphics and blue and white colors together create a great piece of art. The creator of this quilt was obviously a lover of geometry. The border is 9” wide and is comprised of 3 separate strips. The triangle borders are 1-1/2” in width. The white border between those two measures 5-3/4”. Each square in the body of the quilt measures 1-3/4” on each side. The main body of the quilt is almost 57”. The top of a queen bed is 60”. The inner body and inner border of triangle would cover the top of the bed with the remainder draping down the sides. The quilt is machine pieced with some hand appliqué and all hand quilted. 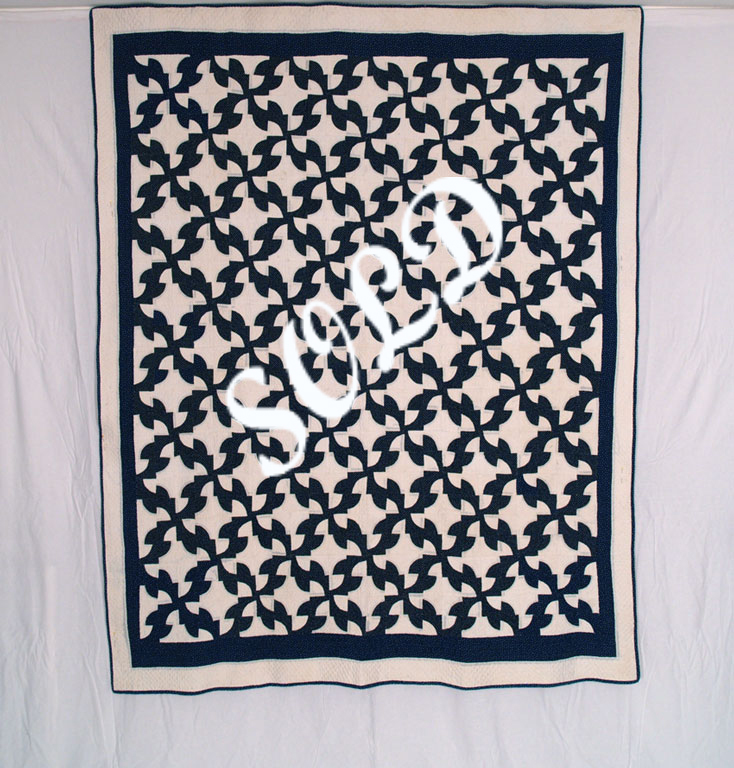 The white border is quilted in meandering vine pattern. The white inner squares are cross hatched in the same direction as the steeplechases. All and all it is a beautiful piece. Organically washed and ready to be sent on approval. When one first looks at this wonderful textile, one immediately assumes it is an overshot coverlet, as I did. However, it is not. 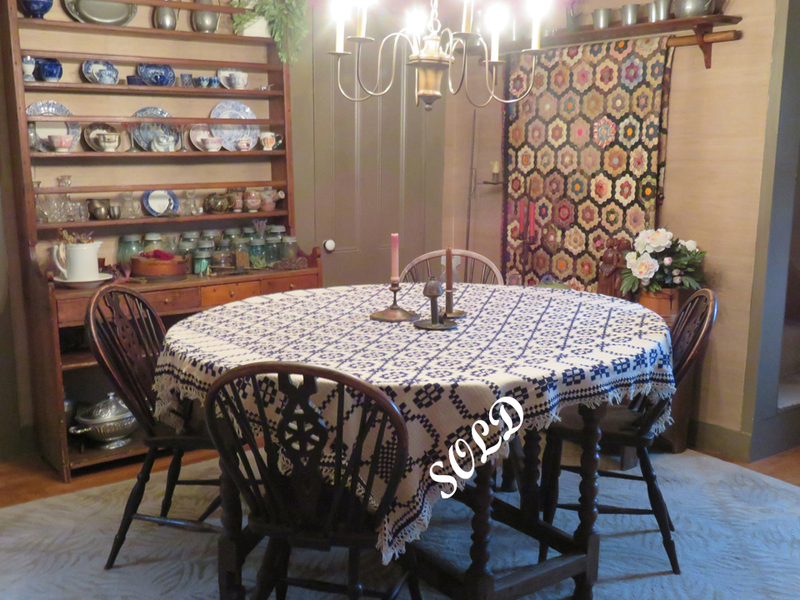 It’s a mid 19th century knit table cover created in strips of various widths from apx 9” to 19” and then sewn together with the same ecru thread that was used to knit this masterpiece. Crowning this amazing piece and totally encircling it is a 1-1/2” handmade fringe, also of the same ecru thread. I have photographed this piece on my dining room table to show how gorgeous it is. It’s also in perfect, unused condition. Hand washed by Betsey and ready to adorn your home. It will be sent on approval. 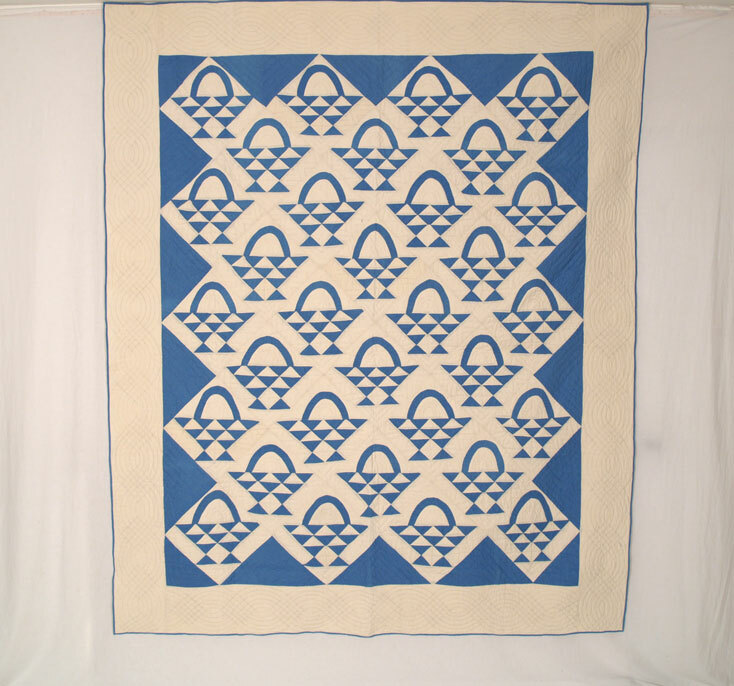 A quilt pattern that was originated along the eastern coast quilt as the ocean wave. Later it grew into the Martha Washington by creating 2 triangles from the center square. As this quilt is a two color quilt, it becomes very easy to coordinate into a color scheme. Created from purchased fabric telling us something about the socio-economics of the family that they were of comfortable means. This graphically wonderful quilt would look wonderful either as a quilt for your bed or as art for your wall. The quilt is completely hand pieced and hand quilted. This quilt is a piece one would buy for the graphic pattern and not the quilting. The back of this quilt is linen, the front is a very fine cotton fabric. The center blocks are 5” square. The sashing, which becomes the pieced ocean wave is apx 3-1/2” wide. The border is 1-1/4" and the binding measures 3/8”. This quilt has been lovingly used, showing some wear on the binding. The family name will be provided upon sale. Organically hand washed and ready to be sent on approval. This fabulous mid century Chips and Wet Stones variation of a Mariner's Compass was created by a woman who was a master at geometry and a master at sewing. The 12 circles measure 15” around, the inner circles 5-3/4”. The large triangles measure 5 x 5 x 2-1/4” and the small 3-1/2 x 3-1/2 x 2”. Usually this pattern is appliquéd onto a solid background. This pattern is pieced into the quilt. A wonderful dark indigo combined with a beautiful white fabric to create the most common color combination in America. Exquisitely hand pieced and beautifully hand quilted, this would look spectacular on a wall and would also fit a single or a queen bed. 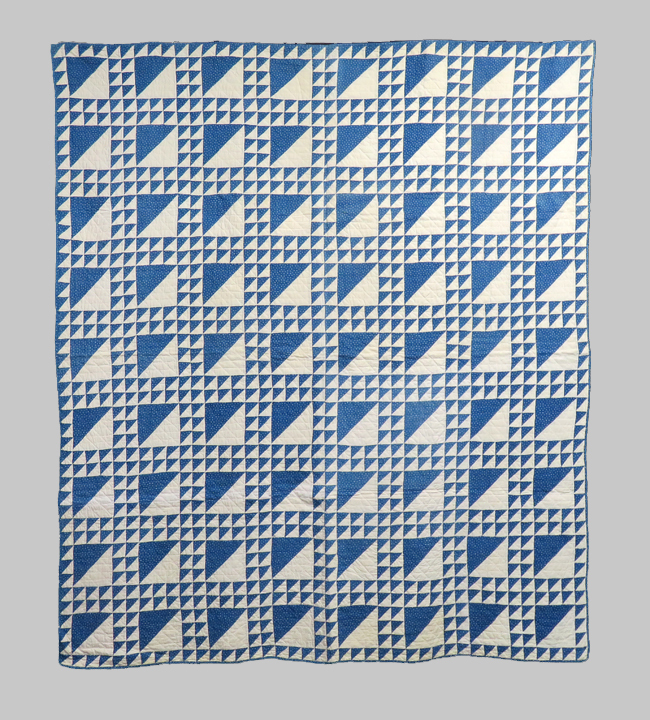 This wonderful geometric 19th century blue and white quilt is comprised of a few different indigo fabrics. Indigo dyes develop the depth of color from how many times the fabric is put into an indigo bath. Most of these are medium indigo and some are darker indigo. 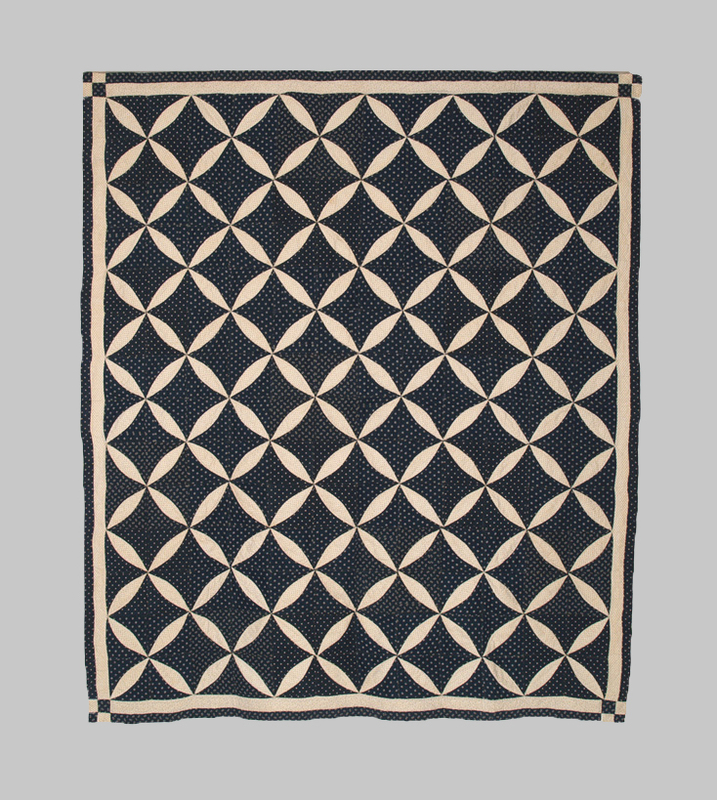 The bars measure 1-1/4 x 3-3/8", the indigo squares measure 3-1/2 x 3-1/2” and contain a quilted design, and the 16 square blocks measure 5 x 5”. Each small square in the 16 square block measures apx 1 x 1”. The 1/4” binding is half machine sewn and half by hand. This quilt will nicely fit a queen size bed. It is machine pieced and hand quilted. The backing is a white muslin. In unused condition. This is ready for your bed or as art for the wall. It's antique but looks modern. This exquisite Double Irish Chain is pieced both by hand and by machine. Some of the most diminutive quilting stitches I have ever seen cover the entire quilt. A contrasting border quilting is on the diagonal, in a 3/8 inch parallel line. The border brings this quilt to a higher level of sophistication. The indigo squares measure approx. 1-3/4 inches. The double border measures 10-1/4 inches. The same fabric is used to create a 1/4" binding all executed by hand. 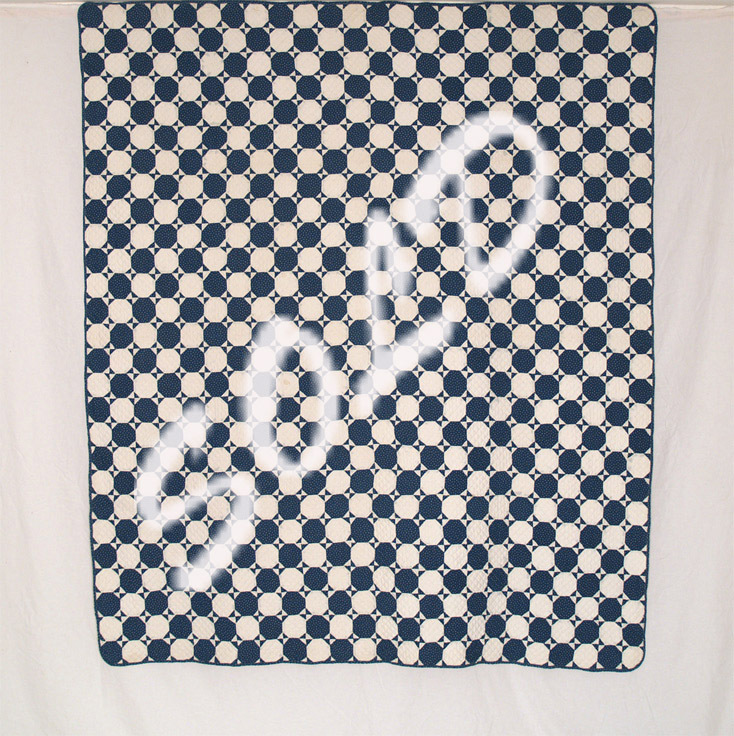 Quilting executed in the white squares varies from diagonal, horizontal and/or cross hatching. How wonderful to have a quilt that will easily fit today's queen size bed. In apparently unused condition and professionally hand washed by Betsey. How exciting to find an unused quilt that can actually fit today's king size beds. Comprised of two fabrics, white and a blue calico with a tiny flower and a dot of pale orange in its center. Made of 8 inch blocks with semicircles in each corner with 2-1/4 inch sides. Every block is outline quilted. The semicircle corners have echo quilting. The center of each block is done with spiderweb quilting. There are places where you can still see the pencil lines the quilter used. There is a separately applied 3/8" binding. In unused condition, professionally hand washed by Betsey. This classic Lemon Peel in the two color combination of indigo blue and white is just fabulous. It is comprised of three different indigo prints which are paired with black and white mourning prints. The blocks measure 5 1/2 inches square and are skillfully pieced to form the early and sought after Lemon Peel, also called Rob Peter to Pay Paul, pattern. Double borders measure 1 ¼ inches wide for the outer indigo border, and 1 3/4 inches wide for the inner black and white mourning print border. The addition of a four patch block in each corner of the quilt adds a special touch to the borders framing the inner design. Hand quilting on this piece includes outline quilting for the body of the quilt and a single cable in the double border. The backing is white and the indigo outer border folds over to the back and is hand stitched down to form the ¼” binding. This would be a wonderful addition to any quilt collection or a wonderful first quilt in excellent condition. 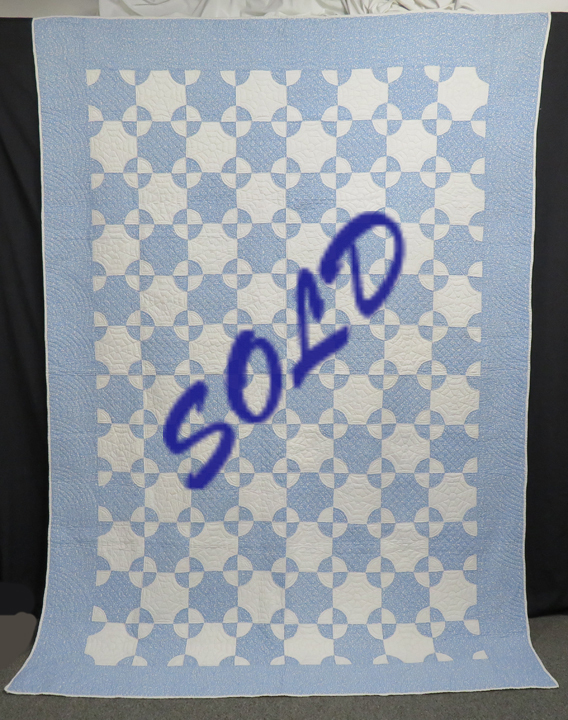 We are happy to ship this quilt to you for viewing in your home on approval before a purchase decision is made. This quilt already has sleeves sewn on the back in case you would like to hang it as art on a wall. Simple yet striking graphics in indigo blue and white! 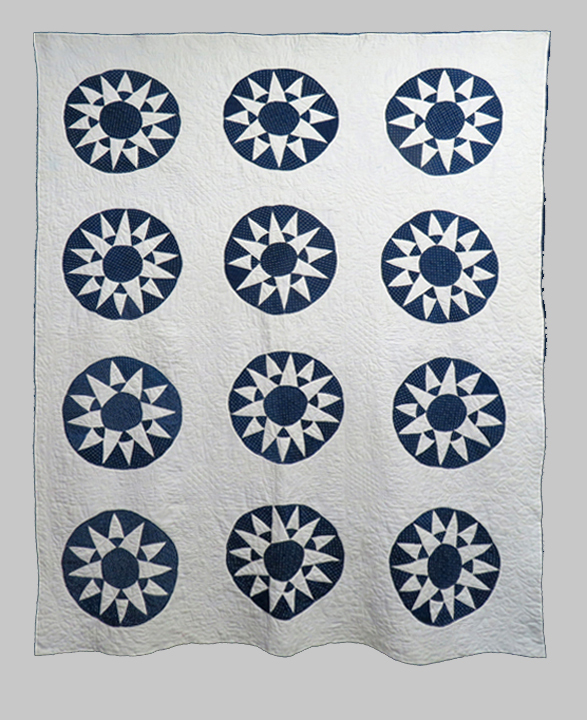 Mini white stars on indigo cotton pairs with pristine white cotton in this fabulous quilt. 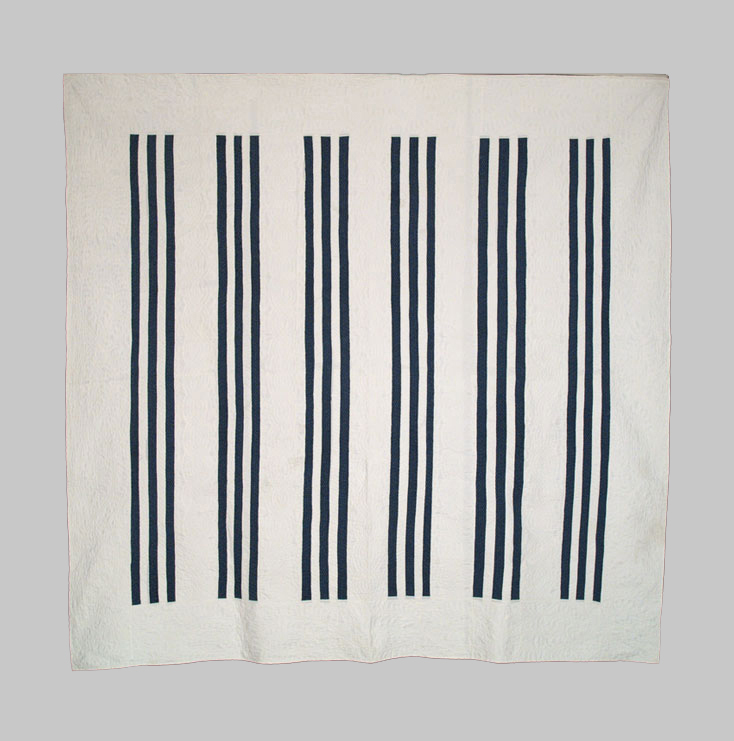 Six 5 ¾ inch wide indigo and white pieced bars alternate with solid white bars across the quilt. Slim indigo strips within the bars measure just 1 ⅛ inches wide. A lovely 8 ¾ inch wide white border surrounds the bars design. Treadle sewing machine pieced and hand quilted. Quilting consists of feathered twining vines in the outer white border and wide white bars, with single cables and parallel lines stitched in the narrow indigo and white strips. Just lovely - see detail pic. The front folds to the back and is hand stitched down forming the 1/4 inch binding. The backing is white cotton. This quilt is in excellent condition with areas of the binding showing slight wear. Professionally hand washed by Betsey and ready to ship to you on approval for private viewing. A wonderful, small scale pattern in indigo and white! This lovely antique quilt is comprised of two deep indigo fabrics; one featuring white polka dots, the other white mini stars, paired with white linen. Small blocks measure just 2 ¼ inches square. The inner stars on indigo border is 2 ½ inches wide, with the white outer border 3 inches wide. Quilting on this beautiful piece is stitched by hand with finely executed echo outline for the blocks, ½ inch parallel lines for the inner border, with the outer border a combination of ½ inch parallel lines alternating with ½ inch cross hatch stitching - wonderful. The backing is white linen with an applied 3/8 inch binding in the same white stars on indigo cotton as the inner border. This is a wonderful example of a popular pattern done exceptionally well from the precise piecing to the double borders and exquisite hand quilting. A must-have addition to a blue and white collection or a wonderful first piece and in excellent condition. 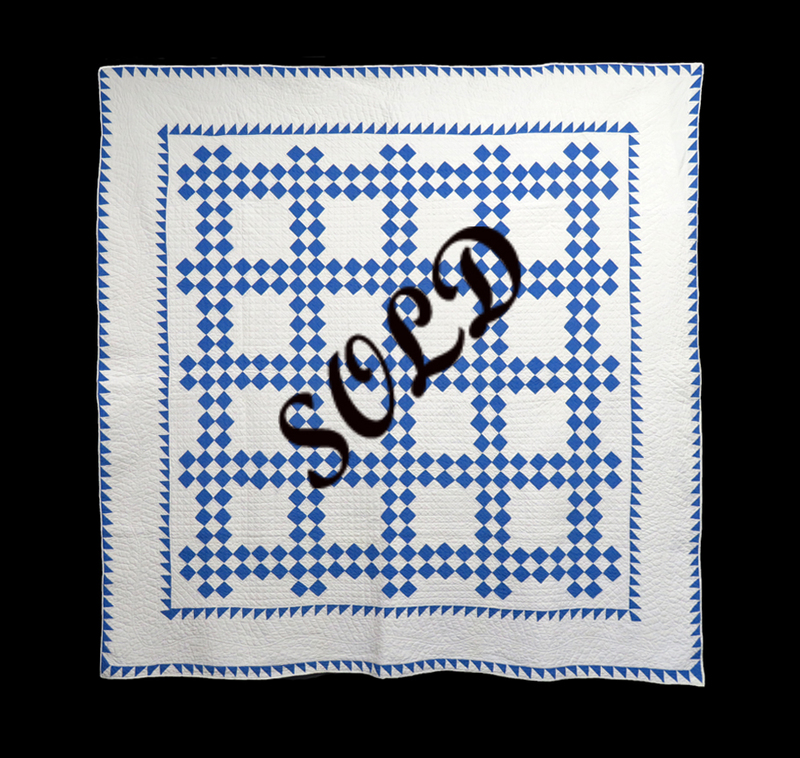 Professionally hand washed by Betsey this quilt can be sent to you on approval for private viewing. 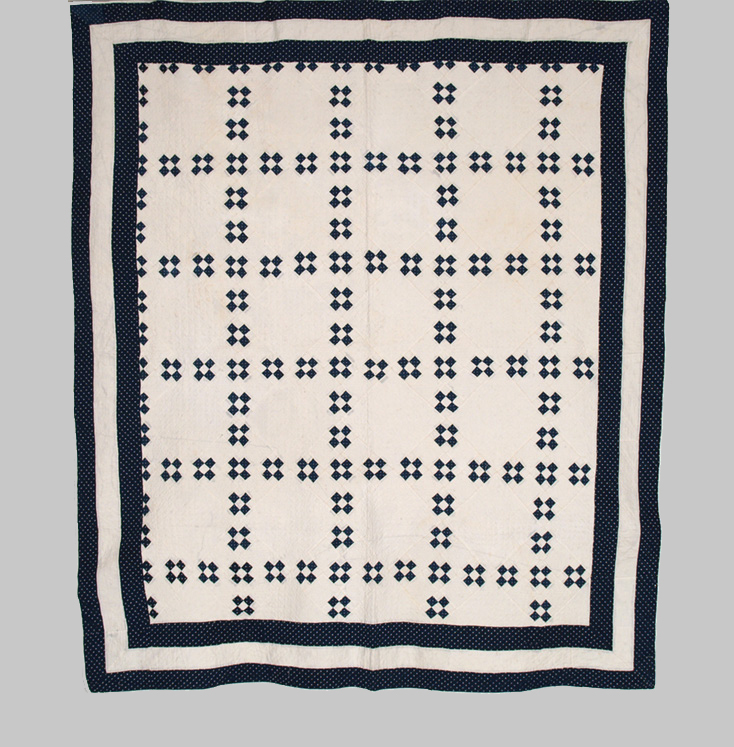 A beautiful Civil War era indigo blue and white cotton quilt in excellent condition. Nine patch blocks measure 3 ½ inches square and are comprised of an indigo blue with white dots print paired with pure white cotton. Large joining blocks are approximately 10 ¾ x 11 inches. A 4 ½ inch wide triple border frames the design. 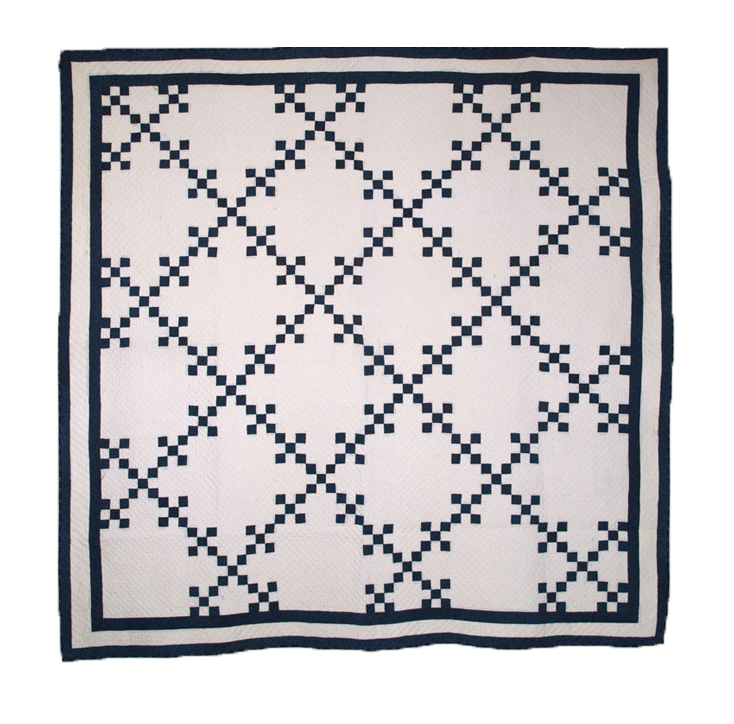 Quilting on this beautiful piece is skillfully executed using parallel lines set ⅝ of an inch apart, with ½ inch diagonal cross hat stitching in all white joining blocks. The triple border has lovely double parallel lines stitched ½ inch apart. The backing is a very fine white cotton with an applied 3/8 inch binding in a c.1860 white dots and lines pattern on indigo cotton. 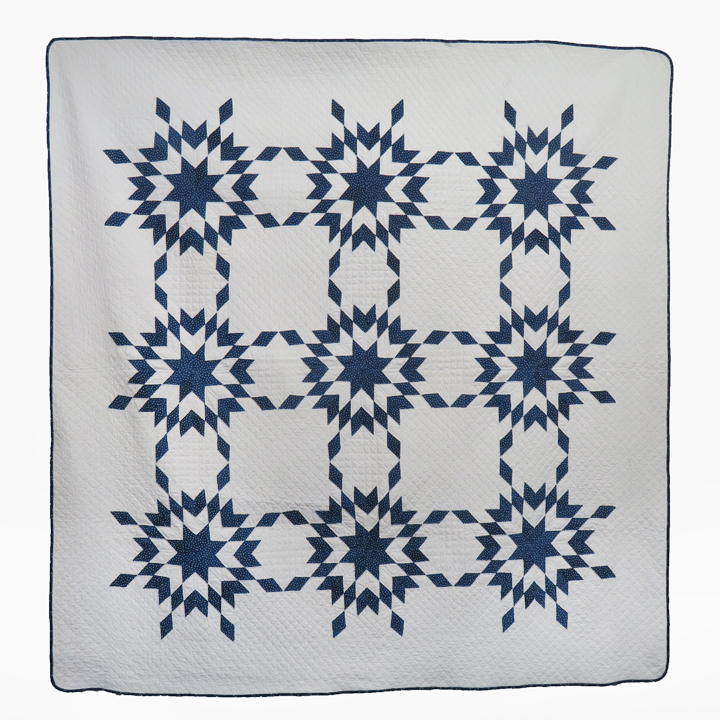 This is a beautiful early indigo and white quilt in the lovely 9 patch Irish Chain pattern. The triple border sets it apart from the rest. In excellent condition it would be gorgeous on a bed! Professionally hand washed by Betsey it can be sent to you on approval. Ask her for more details on this quilt. 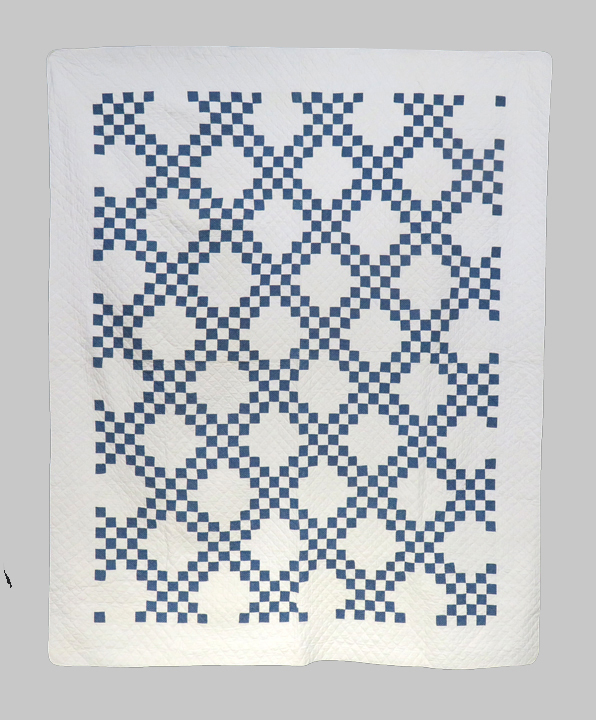 This classic and timeless basket pattern quilt is executed in a two color combination of solid ocean blue and white muslin. Blocks measure 10 1/2 x 11 and are set on point. Inside the wide 7" white border are triangular solid blue joining blocks adding a border element which highlights the gorgeous shade of ocean blue. Nicely executed hand quilting on this quilt includes outline, echo outline, echo zigzag and cross hatch stitching in the blocks and triangles, with a five cable rope stitched in the generous outer border. Betsey gave this crisp quilt its first bath and some faint pencil lines used for the quilting pattern remain. Bleached muslin is used for front and back, with a 1/4" applied binding in the same ocean blue cotton as the front. A wonderful baskets quilt in excellent, crisp condition it would be spectacular on a bed or as art on your wall. You may ask to see this happy quilt on approval for private viewing in your home. This eye pleasing indigo and white quilt is pieced in a miniature double nine-patch configuration. The tiny indigo squares on this piece measure just 7/8 of an inch. Nine patch blocks 2 1/2 x 2 1/2 inches. The larger nine patch blocks contain five of the small nine patch blocks plus 4 solid white blocks. Wide triple borders in both indigo and white showcase a very slightly larger white dot on the indigo print than the print used in the steeplechase design...very nice. Total width of the borders is a generous 7 inches and contains lovely diagonal parallel double line quilting done by hand. The double nine patch blocks are parallel line quilted by hand with just a 1/4 inch between. Large white joining blocks have 3/8 inch cross hatch quilting by hand. This is a gorgeous antique quilt that has so much going for it - a classic indigo and white palette, triple borders, tiny pieces and lovely hand quilting. A wonderful, warm and cozy antique quilt that has been used but lovingly cared for and is in excellent condition. The backing is white cotton as is the scant 1/4 inch applied white binding. It would be marvelous as art on your wall or equally as charming on a bed or used as a design accent in any room. Professionally hand washed by Betsey it can be sent to you on approval for viewing in the privacy of your home. Such an eye pleasing indigo and white quilt created using a combination of the Broken Dishes and Snowball patterns. Blocks measuring approximately 2 ¾” wide contain one octagon piece and four corner triangles measuring a mere ¾”. A mesmerizing effect is achieved through the positive/negative arrangement of octagons (snowballs) and triangles (broken dishes) in this great piece of art. 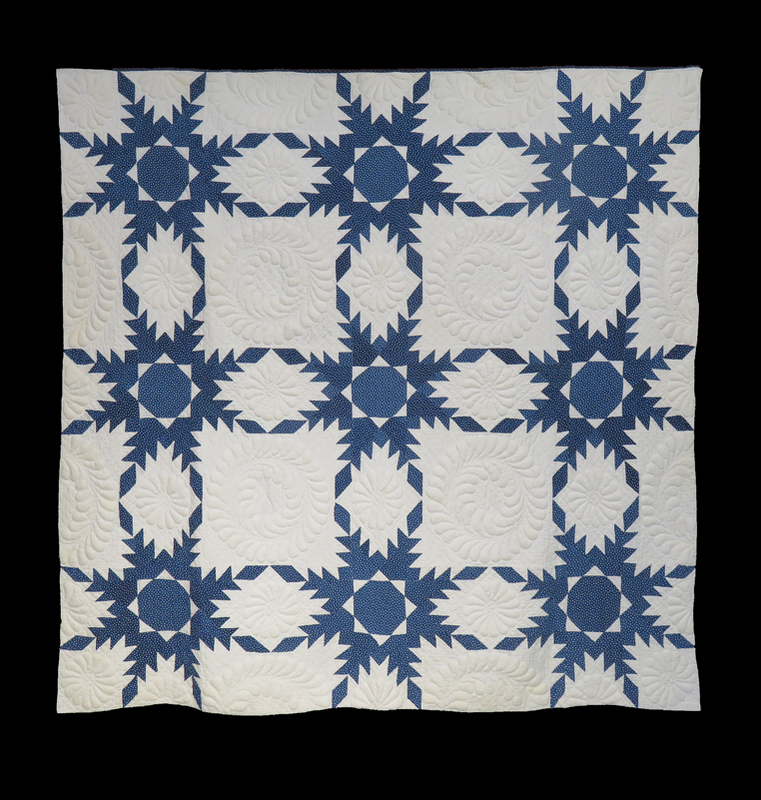 A single indigo cotton with small white stars and an off white cotton are the only two fabrics used in this lovely quilt. Even the 3/8 inch applied binding is the same white stars on indigo fabric used on the interior design. The maker also showcased her ownership of a new treadle sewing machine by placing a row of topstitching on the binding! Other than that the quilt is completely hand pieced and hand quilted with cross hatch stitching in the white octagons and parallel lines in the blue. The backing is the same off white cotton as used for the front. 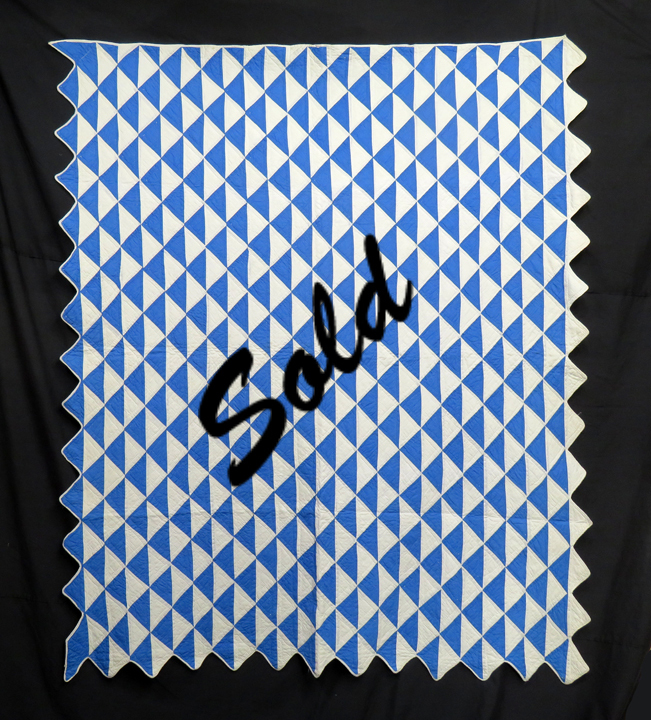 This is a wonderful, warm and cozy indigo and white quilt in excellent condition that would be marvelous as art on your wall or equally as charming on a bed. This quilt, which has been professionally washed by Betsey, is ready to send to you on approval. A perfect quilt for a lover of blue calicoes! Various indigo calicoes were used in the formation of the hand pieced blocks in this terrific Goose and Goslings patterned quilt. An indigo with small white stars is used to join the 7 ½” blocks and also forms the outer 3” wide border joined by machine. Various indigo calicoes form the geese and goslings and include miniature patterns of white stripes with flowers, mustard dots and blossoms, and white speckled hearts. Finely executed hand quilting on this piece include diagonal cross hatch and parallel lines done in the tiniest of stitches. 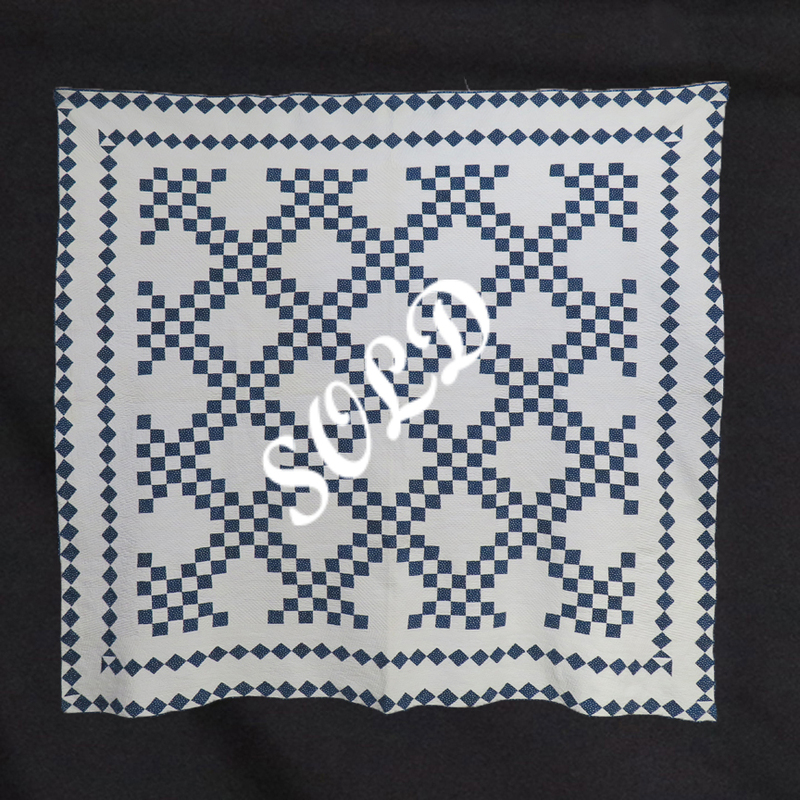 The backing is white linen and the ¼” indigo binding was applied by machine. A soft and cuddly quilt in excellent condition that has been used but lovingly cared for. Professionally washed by Betsey. Quilts are always sent on approval.